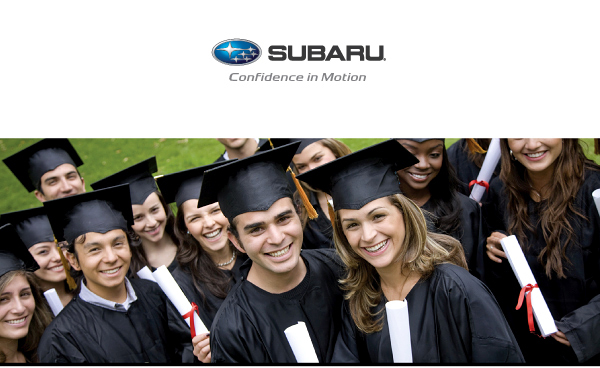 Recent and soon-to-be graduates can apply to finance or lease a new Subaru vehicle under a College Graduate Program for leases and loans approved through Subaru Motors Finance. In addition, all qualified applicants are automatically eligible for any special lease or retail offers currently available. All New Subaru Models are eligible. Applicant must be graduating within 6 months or who have graduated within up to 24 months from date of application with a Bachelor's, Master's, or Associate Degree from an accredited 2 or 4 year U.S. College, Graduate School (including Doctorate) or Nursing School. a copy of final transcript that states type of degree and date earned. For the applicant who has graduated within 24 months from date of application: a diploma. No derogatory credit history, past or present. For joint applications, both applicants must meet all program eligibility requirements. Program eligibility is subject to Subaru Motor Finance's review of documentation and verification before funding; additional documentation may be required. Applicant must have proof of employment and income. If employment has not yet started, a letter from the future employer that shows a start date within 90 days of the current date and salary is required, along with verbal verification from current or future employer. Standard rates apply. Retailer participation is allowed according to the applicable Product Reference Sheet or program sheet. 1 The College Grad Program cannot be used in conjunction with the Mobility Equipped Program. Not available on contracts submitted to Chase Custom Finance. Note: All applications subject to credit approval by JPMorgan Chase Bank, N.A. through Subaru Motors Finance (SMF) and programs may change at any time. Not all programs available in all states. All financing on approved credit. Information provided by subaru.com and available through Subaru Motors Financing.